Pennsylvania requires supervisors of food service establishments and non-retail food service establishments be certified in food protection. This means a person-in-charge, an owner, or manager of a food establishment – (i.e., restaurants, bars, cafes, bakeries, delis, mobile vending, food trucks, assisted-living, day care centers, and convenience stores) become certified by taking a approved food manager training course and successfully passing an accredited food manager certification exam. The Pennsylvania Department of Agriculture – Food Employee Certification Act, 3 Pa C.S. §§ 6501 – 6510, which took effect January 22, 2011, requires one supervisory employee per food facility to become certified in food safety and sanitation by taking a nationally recognized food certification class and obtaining a National Certificate of completion. 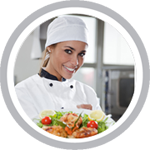 We offer online HACCP Training in Pennsylvania for: Philadelphia, Pittsburgh, Allentown, Erie, Reading, Scranton, Bethlehem, Lancaster, Levittown, Harrisburg, Altoona, York, State College, Wilkes-Barre, Norristown, Chester, Bethel Park, Williamsport, Monroeville, Drexel Hill, Plum, Easton, Lebanon, Hazleton, New Castle, Pottstown, Allison Park, Johnstown, West Mifflin, Chambersburg, King of Prussia, Murrysville, McKeesport, and many more!